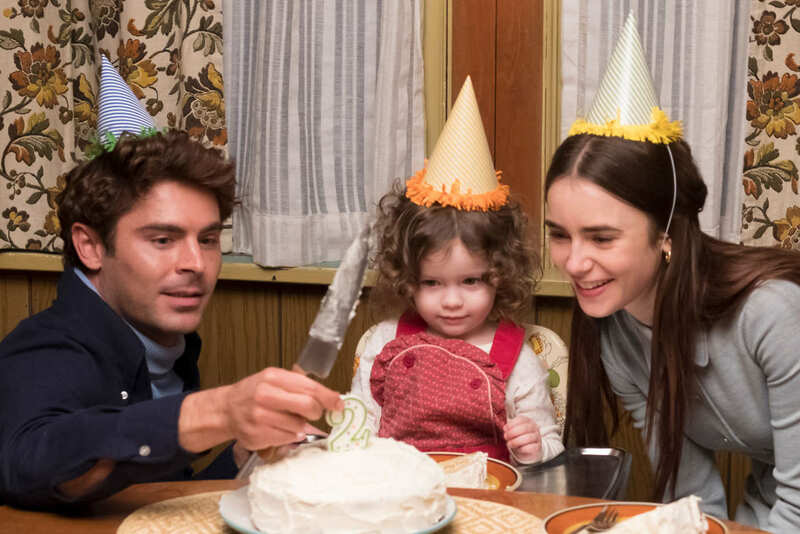 A sense of deja vu hit me while watching Joe Berlinger's buzzy Sundance film with the eye-catching title, Extremely Wicked, Shockingly Evil and Vile. The feeling that I had sat through a similar film at Park City with a lot of buzz, a loaded cast of stars, and a big name playing an infamous figure in celebrity history. That film, sadly, was Lovelace, and like it Berlinger's movie doesn't have much going for it other than a charismatic, perfectly-cast lead. Zac Efron's All-American good looks and boyish charm make him the right choice to play serial killer Ted Bundy, who seduced his way into murdering dozens of women. Even as charges mounted against Bundy in multiple states and he fought to defend himself in a court of law, women were willing to throw themselves at his feet, taken by his smile and magnetic personality. But Berlinger's film teases more than just a look at Bundy's prolific murder career. One woman totally swept off her feet by Bundy was Liz Kloepfer(Lily Collins), a single mother who let's him into her home and into her life. Berlinger teases us with a movie that he gives up on way too early , one that explores Bundy's duality as a family man living with Liz, while hiding his darker side from her; a hug and a birthday celebration with a butcher knife clutched in his hand. We see Liz falling in love with Bundy, and accepting his excuses as his name mysteriously comes up as a suspect in a series of killings, always of young women. Bundy's got an excuse for everything, and Liz is eager to hear them. The perspective Berlinger chooses is a fascinating one, and something we haven't seen before. Berlinger's documentarian instincts kick in exploring the personality of the one person who was duped by Bundy more than anyone. But Berlinger doesn't show us how he won her over to such an extent that she was willing to overlook the obvious signs of danger. We see their first date, in which he picks her up at a college bar (the idea of Bundy stalking a place frequented by young women is chilling in itself), perhaps with the idea of killing her, if she hadn't revealed to him that she is mother to an infant. From there, Berlinger jumps ahead a few years just as the accusations are beginning to swirl, and it feels like some crucial context is missing. Still, if Berlinger had stuck to his guns we'd be talking about a much better movie than the finished product. However, Berlinger can't help but veer into less-interesting, oft-covered territory. Soon the movie is less about Liz and more about Bundy's many arrests and the eventual circus trial in Florida, with much of the insane dialogue pulled straight from the actual televised event. Despite the title, which is quoted from the statement by Judge Edward Cowart (John Malkovich) when sentencing Bundy to the death penalty, we don't see any of the murders take place. The Bundy we see, at least in the beginning, is the caring man Liz fell in love with. Later, as certain revelations about Liz come to light, it makes the decision to show things from her point-of-view confusing. Berlinger could almost be accused of romanticizing Bundy, especially by refusing to show his crimes, but I found him to be pretty heinous simply for the mental abuse he was willing to inflict on the women around him. I didn't need to see him in action. As the film begins to drag on, Liz fades into the background although Berlinger keeps tabs through brief scenes of her downward spiral. Bundy won't stop calling her, despite having a new woman (Kaya Scodelario) ready to defend him privately and publicly. Liz drinks and smokes herself into a tailspin, but still manages to find a safe new boyfriend (Haley Joel Osment) who, we know instantly, doesn't stand a chance against the spectre of Bundy. As she sits riveted by TV coverage of the trial, we're also taken by the sheer lunacy of it. But as the credits roll minutes later, and Berlinger shows archival footage of the real events he just depicted on screen, it dilutes rather than enhances their impact. If Berlinger wanted to do a documentary, he should've. Oh wait, he did, and it's already available on Netflix.